Got a Lego® lover at home like I do? A few years ago, while perusing an edition of Family Fun Magazine, I came upon an article about using Legos® or other building bricks to encourage creative writing. The picture showed dozens of bricks with handwritten words on them. These words were rearranged and stacked together to make silly sentences and short stories. At the time, I didn't have a writer, BUT I did have a preschooler learning to decode letters. I logically reasoned that if you could write entire words on longer bricks, you could write letters on shorter ones. So, with a few handfuls of our embarrassingly large set of Duplo bricks that my two kids had outgrown, I made some DIY alphabet blocks. I wrote out lower case letters on some left-over yard sale price tags making sure to have 3 of each vowel, 3 of each commonly-used consonant, and 2 of all other consonants. I attached these stickers to each side of 20 Duplo® blocks, clipped the blocks together, and stored them in a zippered storage bag. Over the years, I have not only used these handy alphabet blocks to review the ABCs with my preschoolers, I have also whipped them out for some kinesthetic reading and word-building/spelling practice with my older kids. For more ways to incorporate Legos® into your homeschool day, be sure to visit my Lego® Love Pinterest Board. Like this easy-to-make manipulative? Well, here's a few more. Love this idea! Can't wait to make it and use it with my kiddos - who all love Legos! What a fun activity! Thanks! You're welcome. They are quite a hit around here too! I am doing pre-reading activities with our 5-year-old and these will be a hit! I hope you both have a great time with them! Love these ideas! The problem I'm running into in our house currently is this: How do I work these into her "worksheet" based phonics program? We are currently using Abeka's Letters and Sounds 1 and Language 1 seat work books, and they take her a good 20 min to accomplish just on their own. With so much time on the seat work, I find it hard to have another 10-15 min in each day of manipulative work when there are other subjects vying for our precious time. When/how do you work in manipulative work in your son's day? And do you try to replace parts of the seat work with the manipulatives? I am ready to throw in the towel on this phonics program because it is so tedious and she is dying under the weight of the dry work sheets--every.single.day. They teach what she needs to know well, but she and I wish it could be more fun. Great question, Krista! What many people don't know about the ABeka worksheets is that they were created for review purposes only. The real teaching/learning comes from the curriculum guide which provides ample opportunity for manipulative use. The worksheets were designed for classroom use and keep kids busy reviewing while the teacher is conducting a reading group with a handful of students. 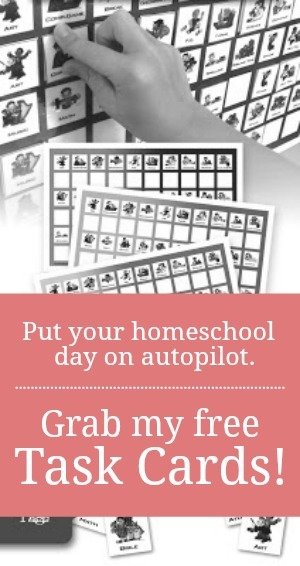 So, as a homeschooler, if you are doing all the teaching that comes from the curriculum guide, the worksheets are often unnecessary. Oh my....I feel terrible! That poor girl! I could have been making this so much more fun all the time and didn't even know it. Thank you for telling me this--I appreciate it so much. I am looking on Abeka's website right now for the curriculum guide. Hoping that her distaste of phonics can turn around now. Thank you for taking the time to write back, Jamie! Okay, so I found two things, not sure which of them I should get. If you have a moment could you point me in the right direction please :D ? I see a "Writing and Seatwork 1 Curriculum/Lesson Plans" (which has the pictures of our two seatwork books on the cover along with several other books we don't have) and then I see one called "Phonics & Reading 1 Curriculum/Lesson Plans" (which also have pictures of our two books on it along with a spelling book and some readers on the cover). I'm confused. Don't fret over it, Krista. ABeka doesn't always make that very clear because they advertise more to Christian Schools than homeschoolers. You want the Phonics and Reading 1 Curriculum Lessons Plans. The Seatwork lesson plans just assign pages numbers and dates for you. But, at the bottom of each page in the workbook, you'll find not only the page number but also the lesson number that corresponds with that page. Just remember, never feel married to the seatwork page. It's only for review. Sorry, that may not have been very clear. Let me try again. You don't need the Seatwork plans BECAUSE the workbook page itself tells you what lesson it corresponds with. The Seatwork plans also have additional seatwork ideas for school teachers who need to keep really fast students busy for a longer period of time...like, "Write out chart 12 on notebook paper. Copy these sentences with correct punctuation." Things like that. Okay! Thank you again, Jamie! I am really hoping this change will make all the difference for our little sweetie! I am ordering the Phonics and Reading 1 Curriculum Lesson Plans today!! THANK YOU!